I’ve got a gift from me to you today, written long before I found publication and was raw with the need to reach and connect and short on literary grace. You may have seen this last year, but it still makes me cry, and like the best gifts, please feel free to share it. However you celebrate the season, we hope you find joy, warmth, and a feeling of completeness. All is calm, all is bright. . . . Humming, Kaylin held her coat closed against the cold, more from habit than anything else as she dodged through the unseeing, evening shoppers. She was anxious to get home. Her work had seemed to stretch forever today, but finally, The Boss had let her go. She couldn’t wait to see her daughter-it had been too long since the entire family had been together. Slipping at the bus stop, she grasped the door to the bus, just making it on behind two tired women as the doors closed. The sound of their money jingling into the box chimed like bells, and the bus jerked into motion. Kaylin stood where she was, gripping the ceiling support as the gears shifted. Her gaze rove over the heads, looking for acknowledgment she existed. There, at the back where the heat didn’t reach, was a smiling face and a beckoning hand. Though she didn’t recognize him, Kaylin went to sit with the old man. She smiled shyly, the anticipation of her coming evening prompting her to be more bold than usual. “I’m going home for Christmas,” she said by way of greeting as she jammed her gloves into a pocket. “First time?” the old man murmured, his brown eyes going sad in memory. She nodded. “Since my accident. I can hardly wait to see everyone together.” Kaylin put her hands in her lap, glad she couldn’t feel the cold anymore. She didn’t know what to say. “This is my stop,” she said, glancing out the window to the colored lights. Giving him a hesitant smile, she hastened to the front, edging to the sidewalk past the three girls giggling about the presents they had gotten for their boyfriends. Kaylin’s mood went soft as she took in the familiar street gray with twilight. The curb was jammed with cars. A noisy, joyful reunion on her front steps had the dogs barking. Excitement tingling to her toes, Kaylin waited on the walk, following the last of the children inside. Her shoulders eased as she stood in the entryway, basking in the cheerful clutter and the too-noisy greetings. She waved as she spotted her grandmother in a corner, deep in the thick of it. The old woman’s eyes sparkled as they met hers. Her fingertips again had a rosy glow, and the blue tint Kaylin remembered was gone. Relieved her grandmother understood, Kaylin followed the smell of heated punch into the kitchen. She stopped in the open doorway as her heart clenched. Kaylin’s hands reached out, but she stood unmoving, forcing back the unexpected tears as her husband set aside his dishcloth and went to their daughter. “Hush,” he said, the pain in his voice causing Kaylin’s throat to tighten. “I can’t see her,” Jasmine said, sniffing as she licked the frosting from a finger. Kaylin ached. The Boss had warned her it would be hard, and she thought she could handle it. But this? This tore at her. Kaylin came close to stand behind her daughter and nudged a cookie, as if she could make the star any less lopsided. Perhaps . . . .
And so she was a silent participant, each moment harder than the previous, a bittersweet mix of memories. She hovered in the kitchen while dinner was prepared, blowing on the gravy to keep it from boiling over until someone remembered it. She watched the rolls brown through the oven window with Jasmine, admonishing the child they weren’t done yet when Jasmine pronounced them finished. 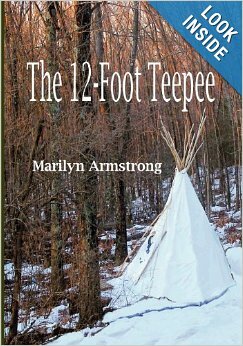 She stood in the archway to the living room and worried about the carpet as paper plates over-flowing with food were balanced on knees. She sat at the kitchen table while the dishes were washed, catching up on the women’s gossip with her fingers curved around a forgotten cup until it was whisked away. And then it was done. Kaylin knew the signs: the last swallows of coffee, the slowing conversation, the children collapsing in their mother’s arms. Kaylin sighed. She didn’t want it to be over. Jasmine was slumped in her frills and white stockings in her father’s arms, too sleepy to be anything but content. Kaylin sat on the arm of the couch beside them, running her fingers unfelt over her daughter’s hair. There was one final tradition as yet undone, her most cherished part of the evening, and Kaylin’s heart fell when the first of the coats appeared. They had forgotten. “Wait, Daddy.” Jasmine stirred as her father rose to say his goodbyes. Coats were dropped to the couch in the sliding sound of nylon. Her grandmother beckoned, and Kaylin joyfully edged closer to the piano. Jasmine wiggled down to sit on the long bench before the battered keys, her father standing behind her with his hands on her shoulders. Kaylin could see a glimmer of tears in her mother’s eyes as she took Kaylin’s usual spot before the piano and began to play. Tears pricked at Kaylin’s eyes. Her favorite. Voice quavering, she joined her voice to her family’s. “Round yon virgin, mother and child. Kaylin’s throat nearly closed, and tears slipped down her cheeks. Angels could sing. And on Christmas Eve, they could be heard by those who listened. 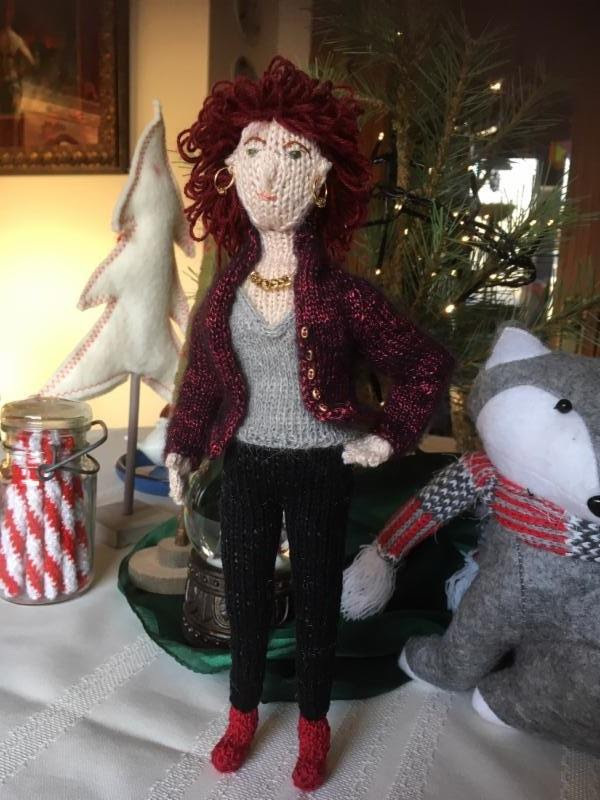 Kim has your “Perfection” gift card for under the tree and an exclusive one-of-a-kind Rachel Morgan doll designed and created by Kim herself. You will need to scroll down the page to view each of these items on Kim’s blog. Take time this holiday to read a good book. 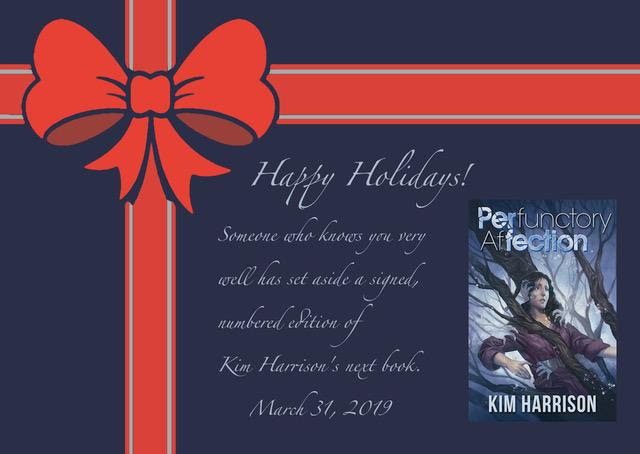 Even Santa enjoys a Kim Harrison novel. Freebies for The Drafter and The Turn are still available in limited quantities. Send a SASE to address below. If you need assistance, Tim can be reached via the email address below. Kim is a brilliant writer.